Clark County, Washington, just across the Columbia River from Portland, is in the middle of a measles outbreak. Washington's governor has declared a state of emergency. At least 58 people have been infected since the outbreak began in January, according to state and local health officials. 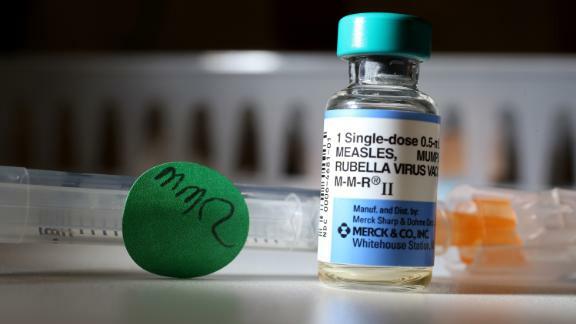 Officials in Clark County, Washington, publish a list every day of where people infected with measles have been. Among them: busy spots like Concourse D at Oregon's Portland International Airport on January 7 and the sold-out Portland Trail Blazers' home game four days later. There's also a Costco, a Trader Joe's, numerous schools, day-care centers and churches, a swimming pool and even a trampoline park. "It is exquisitely contagious," said Dr. Alan Melnick, director of the county health department. "You can be in a room where somebody with measles had left two hours earlier and still get the disease." Clark County, just across the Columbia River from Portland, is in the middle of a measles outbreak, and Washington's governor has declared a state of emergency. At least 58 people have been infected since the outbreak began in January, according to state and local health officials. "The thing that keeps me up at night is having a death, you know, a child die from this," Melnick said. Measles kills about 2 of every 1,000 children infected, he said. Kristen Cheatley discovered that she and her 11-month-old, Steel, were in a doctor's office at the same time as an infected child nearly three weeks ago. Steel is too young to get the measles vaccine. Now, he might be infected and a danger to others. He's stuck at home under quarantine for 21 days while his parents anxiously check for measles symptoms, which start like a bad cold before the telltale rash develops. Nurses at one medical center are treating and inoculating kids in the parking lot to reduce the risk of contagion in the waiting room. Measles was eliminated from the United States in 2000. But according to the US Centers for Disease Control and Prevention, "Travelers with measles continue to bring the disease into the US. Measles can spread when it reaches a community in the US where groups of people are unvaccinated." In 2011, a number of travelers from France brought the virus to this country, according to the CDC. In 2014, nearly 400 people were sickened during a measles outbreak among unvaccinated Amish communities in Ohio. In 2015, one infected overseas visitor to Disneyland in California led to 147 measles cases across the United States. And there is another outbreak ongoing amongst Orthodox Jews in Brooklyn New York, reportedly sparked by a single infected child arriving from Israel. The CDC claims that the outbreak in the Pacific Northwest began when an infected child from Ukraine came to Clark County over the holidays. And according to Melnick, "we have large unvaccinated populations in Clark County." As Cheatley said, "for the longest time, I always said, 'well, if they don't want to vaccinate, that's not my problem.' It's become my problem." Clark County schools have some of the lowest vaccination rates in this country. Before entering kindergarten, kids are supposed to have had two doses of the measles, mumps and rubella (MMR) vaccine. But in Clark County last year, fewer than 85% of kindergartners were up to date, well below the roughly 95% vaccination rate required for "herd immunity" to take effect and protect those who are too young or medically unable to be vaccinated. Vaccination rates in Clark County are low partly because Washington allows parents to opt out of vaccinating their children not only for medical and religious reasons but for "philosophical" and "personal" ones. Lawmakers are debating removing those provisions for the MMR vaccine. "Hundreds of thousands of people in my community have been involved in this issue and have lent support to this bill," Rep. Paul Harris told the State Assembly last week. He represents Clark County and is sponsoring the legislation. "They're concerned about our community, its immunity and the community safety." Bernadette Pajer, co-president of the advocacy group Informed Choice Washington, which opposes mandatory vaccination, told CNN affiliate KOIN, "this bill takes away our freedom and says you have to take this flawed product or your kid can't go to school. That is so wrong,"
Anti-vaccination activists protested outside the State Assembly during a hearing on the bill last week. "But that is not the majority of the patients who decline," said Dr. Amrita Stark, a Clark County pediatrician. "Many of the patients who decline are from different religious groups. They are actually more conservative. And many of them are in the Russian population that's here, too." In Portland, the population of emigres from the former Soviet Union is large enough to support five Russian-language radio stations. "I've heard some parents in Portland went to the doctor to get vaccinated, and their kids got 16 shots at a time. And they think that's too much," said Eduard Rusu, who runs a Russian pop station. Rusu said he had an adverse vaccine reaction five years ago and has not vaccinated his own children, who are 6 and 2. "If you read the fine print, I'm sure somewhere there, it says there is a possible fatal outcome there. Some possible fatal consequences. And that gets you a little worried." Stark noted, "a lot of people are still afraid, despite all of the evidence to debunk the association with autism." Andre Dolbinin, the principal of the Slavic Christian Academy in Clark County, which serves the local Russian-speaking community, told CNN affiliate KATU in Portland that he believes his school had one of the first measles cases in the area. He said his staff do not discourage parents from vaccinating. However, some parents believe the vaccination actually causes the measles virus. The school hasn't supplied vaccination data to the state for the past few years. But state records show that at two other former Slavic Christian Academies more than half of students are exempted from the MMR vaccine. Kaley McClachlan-Burton, who usually works in solid waste management for Clark County, is now working full-time online to monitor mentions of the outbreak on social media and correcting what health officials believe are erroneous rumors. "Like the virus actually being caused by the vaccine," she said. "Something known as 'shedding.' The MMR vaccine does not shed." Local officials are eager not to blame one specific ethnic group for the current outbreak. Melnick said he may never know who was Clark County's patient zero. He can't say for certain it was a child from Ukraine. But the strain of measles spreading in the Pacific Northwest is the same strain still going around Ukraine, which sickened 50,000 people there last year. "The virus does not discriminate," Melnick said. "The solution to this is for all us to get vaccinated." He hopes that fear of the current outbreak -- and accurate information -- will raise vaccination rates. Those rates for January in Clark County were three times the five-year average. "With this outbreak," Rusu said, "I will definitely think that I need to put it on my schedule soon and get it done!"